I am about three and a half months pregnant right now, and although I initially thought I would definitely not do chalkboards this time around, I decided doing them monthly might be manageable. So here it is, month three with baby number three! Sleep: I have been sleeping great, aside from one or both of the kids randomly waking up in the middle of the night at least once or twice. It’s not a big deal right now, easy to go give Eloise her paci or Harper her water or snuggle with her for a minute if she is scared, but I think this is going to get harder as the months go on. Getting out of bed during the last few months is never any fun. Best moment this month: Healthy ultrasounds & finding out the gender! Also, having energy & loving coffee again. Worst moment this month: The exhaustion over the first few months has been really hard, trying to run around all day with the girls & still keep up with the house/blog/work/etc. is no joke. But I am happy to report that I feel like myself again & we are finding a good balance. Miss anything: Fitting into all of my jeans/clothes. I also hate random pregnancy food aversions, like when you spend an hour cooking dinner & then all of a sudden you are repulsed by the food and no longer want to eat it. That happened so many times to me over the first trimester & resulted in toast for dinner. Movement: None yet. If I remember correctly, I felt Eloise move sooner than 15 weeks, so I keep waiting and waiting for this one, hoping for it any day now! Cravings: Fish, sushi, cucumbers, watermelon, fountain soda, bacon, egg & cheese sandwiches. Queasy or sick: Surprisingly I have felt really good this pregnancy, hardly any nausea or headaches, unlike my last two pregnancies. Looking forward to: I guess it isn’t really pregnancy related necessarily, but excited for our trip to Florida next month. Between the cold weather & Brandon’s crazy work schedule, it will be so fun to get away as a family for a few days of fun in the sun!! You are having some interesting cravings. 🙂 Love the chalkboard… you look adorable! Aw, congratulations! Another girl! How exciting! I'm glad you decided to continue to do chalkboards. I feel your daughters will grow up to have a wonderful way to review memories. Congratulations and look forward to seeing your girls grow. I'm excited to see the chalkboard! I applaud you for finding the balance with everything…it's something that I am currently struggling with and we only have one almost nine month old! So glad that everything is going well for you this time around! What an adorable 3 month bump! Glad you're feeling back to somewhat normal now, those first couple months can be so rough. 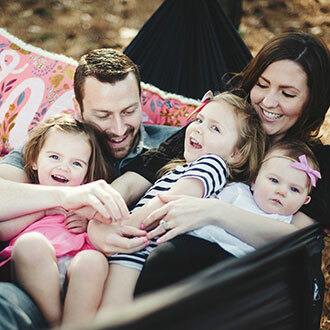 Excited to see your monthly updates with baby #3 – you're super mom for juggling all that you do! So happy to see you doing the chalkboards again! I honestly love your creativity and seeing what you come up with for them! Congrats on baby three! You look great! Florida sounds amazing! We'll be going in June and I can't wait to see both babes play in the sand!! Jessica, you look gorgeous and I admire your mad chalkboard skills! Great job. I love reading your blog and wish you lots of energy and fun for the coming months! Sad we won't be seeing weekly posts but totttallllly get it!!! You look fabulous!!! Looking good! 15 Weeks along is when I started officially feeling more like myself. The first trimester is so draining! 🙂 Cucumbers have been on my craving list also! Our coffeehouse (Solar Roast Coffee) serves a Lox dish with an avocado cream cheese spread, smoked salmon and cucumbers that is absolutely delish! I have also been going for sushi and having the shrimp and other sushi that doesn't include raw fish. Yum! We just moved to NC and I've been dying to get down to Florida for some warmer weather!! We have family in Boca so we may have to go down and visit 🙂 Hope you guys have a wonderful time!!! So excited that you decided to do the chalkboards !! I was looking forward to them so much 🙂 Cant wait to follow along for the rest..
Love seeing your maternity chalk boards…I think monthly is a good compromise this go 'round! You're looking great, can't wait to read about navigating Disney with two kids in tow…while pregnant! We're going the last week of February with the hubs family…6 adults and 4 kids ages 5 to 22 months! Can use all the advice you'd care to share!! Yay! I was hoping you would do this again. I started following you when you were pregnant with Harper and these were always my favorite posts. You look so great! Monthly chalkboards sounds like a great idea! Also – how much are you loving the Blanqi? It was hot in my summer pregnancy, but completely saved my back! So glad you're doing chalkboards again! I was going to ask if you are still working from home, because you haven't talked about it recently. I was going to say the same things – fish and sushi are not the typical first trimester cravings eh? As I said on your Instagram post, I am so excited that you are doing this again! I started following your story when you were pregnant with Harper and these posts were my favorite!! So excited to do this when I start having kids! 🙂 Oh, and your blog is the reason I (finally, just) started mine! Girl you make being pregnant look good! Love the chalkboard! You look so amazing! And I love your chalkboards. I am so happy for your lovely family. Still, I wish you all the best! I love that you are at least doing monthly chalkboards. I love them so and was hoping to see them return!! It is your signature thing and what landed me on your blog in the first place before Harper was born. Have you been thinking of names? I know you didn't share Ellie's name before she was born and I am not asking for you to share…but was curious if you have a long list of possibilities or if you flip-flopping between a few names or if you KNOW what the name will be. I love this! You look amazing & your outfit is adorable! I'm two days ahead of you with my third and I feel like this baby is moving later than my second one too! Sometimes I *think* I maybe feel movement but it's not enough to know for sure ha! And I'm so jealous you know the gender! – two more weeks for me eek! So happy to see the return of the chalkboards with baby garvin #3! You look amazing!! I'm happy that you are doing updates! I just had my forth baby and did updates throughout the whole pregnancy. I am so happy I did, despite how tired I got! It is always so much fun to look back! Hi Jessica, just wondering if you're still working at your marketing job? No, people do not return to regular jeans or jeans at all, for that matter! I LIVE in leggings or stretchy black pants. I have tried to wear jeans and an hour in I'm yanking them off me like they're on fire. Soo uncomfortable lol. xo Chelsea play. wash. rinse. repeat. You look so pretty, Mama!! I'm so excited to see your chalkboards again! 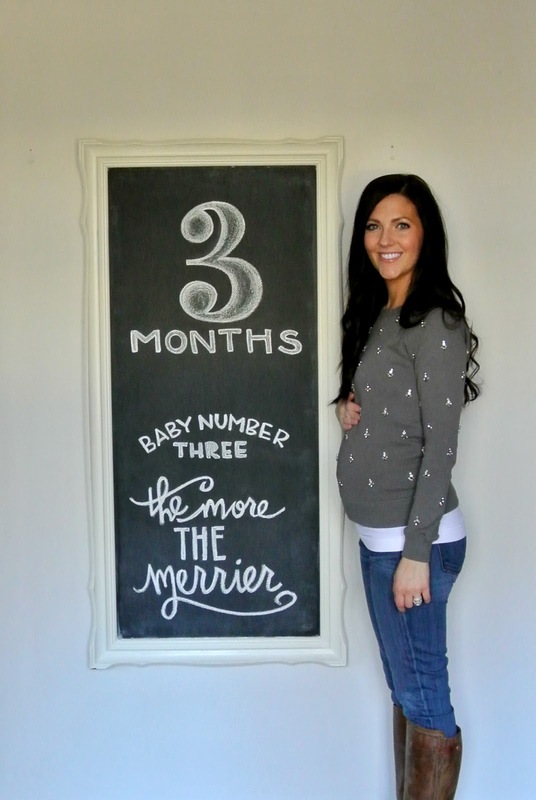 Hooray for more chalkboards and beautiful bump photos!!! Third baby has to get the chalkboard treatment! You look great and I am so excited for you! I am the baby of three girls and I adore having built in best friends. Your girls will be so close!! Hi! I am pregnant for the first time and curious about the blanqi tank. Having never bought maternity clothes before, do you purchase based on your true size? What do you recommend? You look so pretty! I'm glad you are keeping up with the chalkboard updates. Those are really special and you'll be glad you did it in the future! 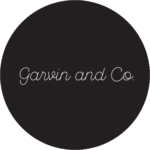 Love to see chalkboards again, as that is what led me to find your blog when you were pregnant with Harper and I was pregnant with my first, who is now almost 3(!). Random request but id love to see a toddler shoe round up for spring and summer. I'm so out of the loop as to what is fashionable/comfortable! Aww!! That's so sweet! Congratulations! you are so adorable. i still can't believe you are pregnant with number THREE! Congrats ! You look amazing! I can't believe you were able to find the gender out at 15 weeks. I was told it can only be done between 18-20 weeks. So happy to see these chalkboards back! I started reading when I saw your chalkboards on Pinterest and I've followed along ever since. You've inspired me to start my own blog but it's still in the early stages 🙂 Hopefully some day I can do my own chalkboards! Thanks for the inspiration. You look great! I know your pregnant (congrats! ), but how do you get back to your prepregnancy figure so quickly? I never struggled with my metabolism or weight until now and I'm really struggling. My son was born May 30th and I'm still 20lbs over. Any tips would be great! I'm so amazed your already know you're having a girl! I am 13 weeks and had an ultrasound today and the tech said nothing about being able to tell us what we are having. Did you have to ask if the tech could tell?? You look great girl! Have fun in my home state boy do I miss the warm weather!!!!! North Carolina has been cold and chilly these days!